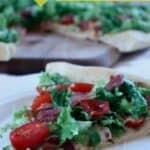 Copycat California Pizza Kitchen BLT pizza is a thin crust pizza topped with mozzarella, bacon and tomatoes in a tangy sauce, and shredded lettuce! A few years ago a friend and I were dining at the delicious California Pizza Kitchen and she ordered the BLT pizza. At the time I thought she was crazy! There were so many yummy pizza options and that one seemed like the weirdest choice to me—until the pizza came out. I was immediately mad at myself for not ordering the same thing! 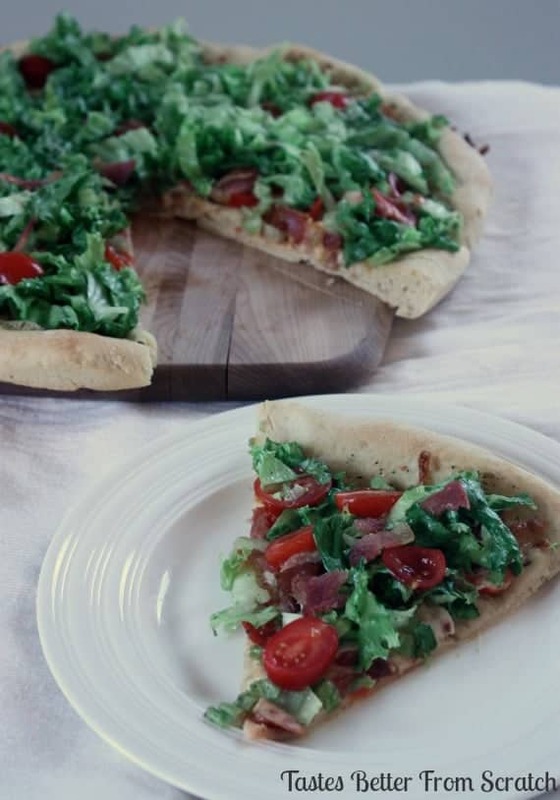 A yummy thin crust pizza baked with mozzarella, bacon and tomatoes in a tangy sauce, topped with yummy shredded lettuce! 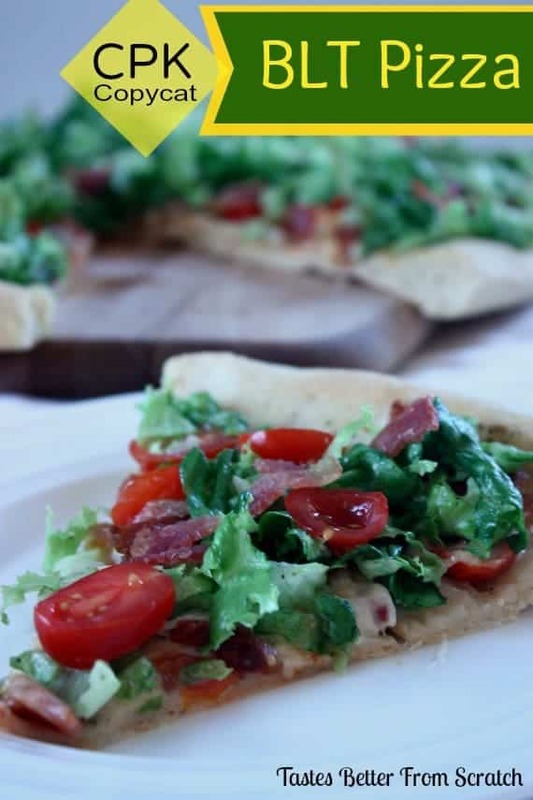 Whether you’ve tried CPK BLT pizza or not, this copycat version is to die for!! This is a huge favorite during pizza nights at our house! In a large bowl combine mayo or miracle whip, dried basil, garlic powder and onion powder. Set aside. Roll out pizza crust until round and thin. Place on pizza stone or in pizza pan. Spread a little more than half of your prepared sauce onto the pizza, making a thin smooth layer. Top with about 3/4 of your crumbled bacon, and 3/4 cup of sliced cherry tomatoes. Sprinkle with mozzarella cheese. Bake at 500 degrees F for 8-12 minutes, or until cheese is bubbly and crust is golden brown. Toss the chopped romaine lettuce with the remaining dressing/sauce mixture. Add the remaining cherry tomatoes and crumbled bacon and toss to combine. Cover pizza with lettuce mixture. Enjoy!